The Saddle-billed stork relies on fish for its primary source of nutrition! 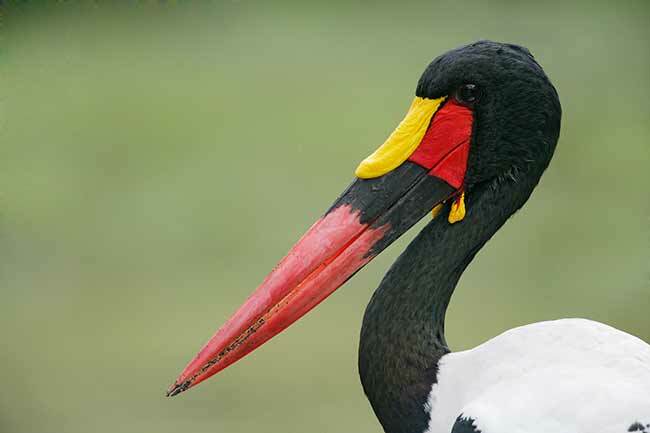 Fish ranging from 15-30 cm long and weighing up to 500g are the ideal size for a saddle-billed stork. When fish cannot be found, then the saddle-billed stork will feed on many things such as: crabs, shrimp, frogs, reptiles, small mammal, insects, young birds, and mollusks. These nutrition conditions are heavily favored in the wetland area of Africa. So you probably wont see them eating a winter flounder or a muskellunge anytime soon! This saddle billed stork is pondering its next victim...um tasty! Check out how they react with other species in the Interaction section!